One of my favorite creations I’ve been making lately is smoothie bowls. I love changing up my morning smoothie and making it into a thick and creamy smoothie bowl. Now that cranberries and pomegranates are in season I’ve been taking advantage of them and blending up this antioxidant-rich one. I love pomegranates. I can vividly remember taking them to school when I was younger and working at those seeds. It was always a fun challenge to turn my fingers bright red in order to get every single last one. I am still equally in love with them, but I’ve learned the trick of hitting it with a wooden spoon to knock them out in a minute flat. (If you’ve yet to discover that, after cutting it in half, hold it over a bowl, flip it over, and hit the skin side with a wooden spoon. Boom.) They’re also an amazing source of nutrients. From fiber, to vitamin C and K, to those wonderful antioxidants. 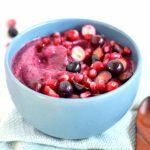 This bowl is serious antioxidant-packed with those pomegranate seeds, cranberries (if you haven’t yet, check out my Cranberry Nice Cream), and blueberries. Plus, there’s so many other nutrients in this bowl from kale, celery, broccoli, parsley, and fresh ginger. On another note, it is the morning of election day, and I of course need to write something about it. 😉 However, I won’t say anything political. All I will say is this, I don’t need to fear about the outcome. I am assured that no matter the circumstance, God is on the throne. People place there trust in the kingdoms of this world, but in having a relationship with Christ, I place my trust completely in Him. I can rest, knowing that God has been, is, and always will be on the throne. He wins. That hope is the anchor to my soul. 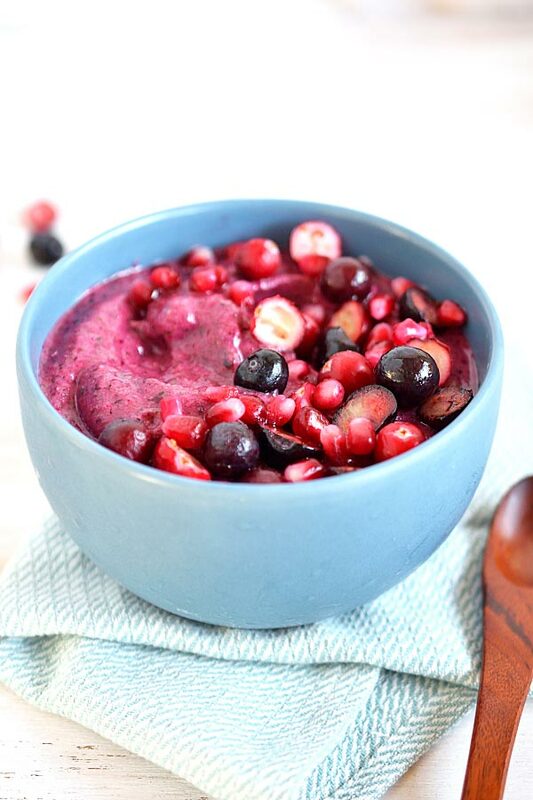 Now on to this delicious, tart yet sweet, antioxidant-powered smoothie bowl!!! Go ahead and give your body the daily immune boost it needs through food! So tasty! 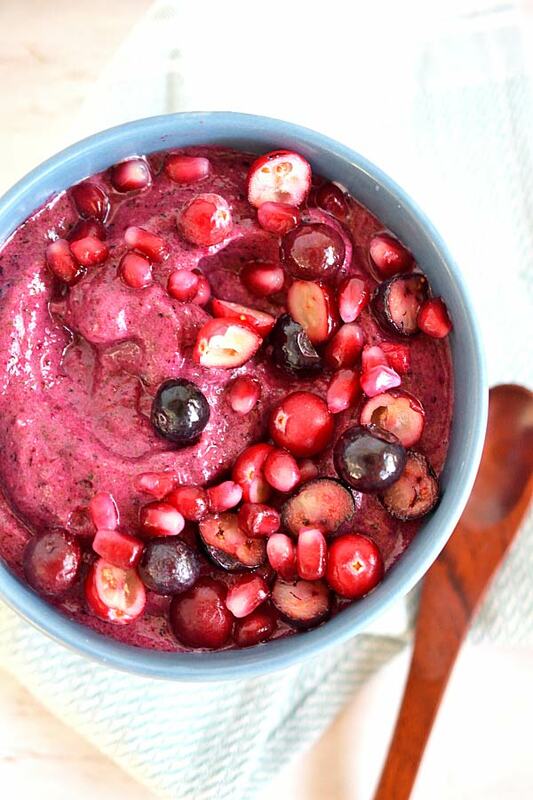 Now add your fruit to the chopped mixture: equal parts cranberries, pomegranate seeds, and blueberries. Try starting with about 1/3 cup of each. Add the equivalent of anywhere from 1-2 bananas. Using frozen banana is key for a thick and extra creamy smoothie bowl, so you can always add more if needed. Lastly, throw in a small knob of ginger, adding more if you know you like that spicy kick. Starting on low, begin blending, adding water. Too much will turn your smoothie bowl into a smoothie, so add just enough needed to help blend. Turn up to high and blend until smooth, thick, and creamy. Pour into a bowl, top with your toppings of choice and enjoy! You'll need a high speed blender for this one. I use a Vitamix. The color is so pretty, my friend! And woohooo to the celery and parsley! The secret goodies! Oh yes! I love adding parsley or cilantro to my smoothies and bowls!